First and foremost, thank you for your support. It's time to be thankful and show our appreciation. What better way than to one, say it, and two, make some yummy food. Here is a creative appetizer for the holiday season. 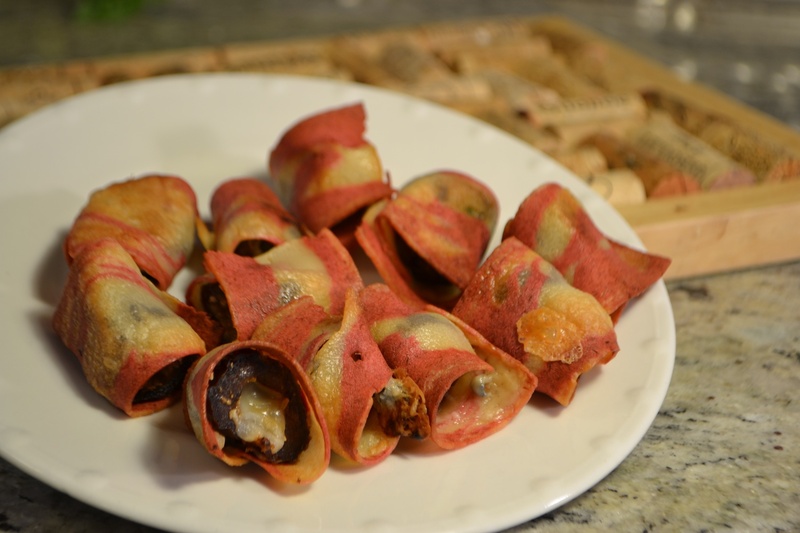 I had this at a restaurant, came home and figured out how to make my version of Fakin' Wrapped Cheese Stuffed Dates. It was a simple appetizer to create an ohhhhh sooooo tasty!!!!!!!!!!!! The easy part is which fakin’ to use. Morningstar Breakfast Strips are my favorite meat substitute. I do try to limit the amount of processed food but I just can’t forgo this one. The strips do contain dairy byproducts and most “veggie” cheeses also contain dairy byproducts. That makes it difficult to make this a vegan dish. You can check out other “fakin’” products but can’t say I like the way they taste. Lastly, the dates. An old Arabic legend tells of the Date palm's creation: "After God had finished molding Man from Earth; He took the remaining material and shaped it into a date palm which he placed in the Garden of Paradise". * Dates are full of vitamins and minerals including manganese, potassium and copper. They are a heart healthy food. It is the only naturally dried fruit. There are hundreds if not thousands of types of dates. The most common are Medjool, deglet noor, and honey dates. I have had them all, ahem those three, and they are yummy!!! Putting all of these ingredients together creates a savory, sweet, salty, creamy, smokey taste of heaven. Visit That's Vegetarian's website, blog , and YouTube channel for more information, videos, and recipes!! You'll find yourself saying "That's Vegetarian?!" Preheat oven to 350F. Cut dates in half lengthwise. Remove pit if there is one. Stuff with sliver of cheese. Wrap with 1/2 Morningstar Breakfast Strip. Stick with toothpick to keep strips in place. Place on parchment paper or silicon-coated pan. Bake at 350 for 15 minutes. Enjoy hot or room temperature.